The United States is in the last leg of the 2016 Presidential Election and, as November 8 approaches, “The Race to 270” is on. But what does this phrase mean? How does is apply to the everyday voter? And what role does geography play in this race? “The Race to 270” refers to the number of votes a presidential candidate must win in the Electoral College to secure the presidency. There are a total of 538 members in the college and, to become president, candidates must earn 50% + 1 of their votes. Electors are appointed by their state and the number of electors is equal to their state’s number of representatives in Congress, giving each state a minimum of 3 (accounting for two senators and at least one representative in Congress per state). Rather than voting directly for their desired candidates, citizens cast their ballot to the electors, telling them who to vote for. Based on this popular vote, the state’s electors put all their votes toward the majority candidate. 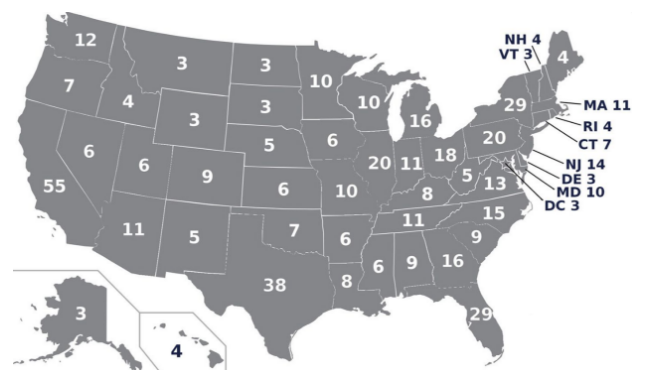 Even if the candidate wins by only 51%, state’s “winner-take-all” policy dedicates that all the state’s electoral college votes can only go to the majority winner. This applies to all states except Maine and Nebraska, who use Congressional Districts to determine electoral votes. Maine has four electoral votes and two congressional districts: the winner of each district gets at one vote and the statewide winner automatically gets two of the four. Nebraska, with its three electoral votes, has a similar system: the statewide winner gets two votes and the district winner gets the third. It is possible for the votes to split, which is important to note in a close election like this years. Unequal voter power: As previously mentioned, a state’s number of electors is determined by its number of representatives in Congress. With each state getting a minimum of one, the number of house representatives are decided by a state’s total population. By giving each state three electoral votes (to account for the two senators), voting power is unequally distributed amongst the population, which can have a big impact on the election. Votes from states with lower populations (such as Vermont and Wyoming) have more power representation in the Electoral College than their population calls. They receive electoral votes that should belong to states with bigger populations, like California and Texas. Therefore, the individual votes of these smaller population states are giving more weight in determine who their state’s’ electoral votes go. Problems with a winner-take-all system: The winner-take-all system can greatly misrepresent the popular vote. With this system, the majority candidate in most states gets all of their electoral votes, no matter how much or little they won by. Therefore, the candidate needs to win states votes more than people’s votes. This can make a massive difference when the nationwide popular vote is calculated, potentially swaying the election results. This occurred in 1876, 1888, and 2000, where the candidate won less than half of the popular vote, but won the election due to the Electoral College’s rules. To see this explained, CGP Grey made video exploring it here. Missing American Votes: There are a huge amount of American votes missing from each election. Why? This is because US territories are not allowed to vote in the election, with the exception of the District of Columbia (which was only granted in 1964). The territories of Guam, American Samoa, Puerto Rico, Northern Mariana Islands, and US Virgin Islands are not granted Electoral College votes because they are not states. They are, however, US citizens and over 4 million people live here (which is more people than live in the city of Chicago!). While the Electoral College has its problems, every vote counts in an election. The deadline to register online or by mail in Illinois is October 12 so make sure you are registered and make your voice heard on November 8. Questions about how to vote in Illinois? Click here for a video explaining IL deadlines, absentee ballots, and more!